A professor assigns students to write a paper. The students examine an issue, review what is already known, think about what they have learned and come to some conclusion. This means that each student-writer must present information and also take a position. The student might support an idea, question it or even disprove it. Or the writer could show how the subject may be understood better or in a different way than it has been. And the student must support the position with evidence. Cultural differences may interfere when international students try to write this way. Writing teachers say students in many countries have learned to write beautiful descriptions about something without ever stating the main idea. 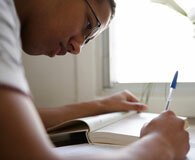 American college students are expected to state their main idea at the beginning of the paper. In other cultures, paragraphs may be organized to build toward the main idea, which is revealed at the end. But in the United States, the main idea of each paragraph should be in the first sentence. Another difference is about writing style. Other cultures may use lots of descriptive words. But American English values short, strong sentences. Teachers at the writing center at Purdue University in West Lafayette, Indiana work with students to improve their writing. Graduate tutor Lars Soderlund says non-native English speakers generally have some trouble with English grammar. He says their sentences may be too long. Or they incorrectly use articles such as "a", "an" and "the." He also says non-native speakers generally use too much emotional language and give too many details before getting to the main idea. The associate director of the writing center, Tammi Conard-Salvo, says international students should look online for materials that explain the kind of writing they will be required to do. They should ask their professors for help. Most colleges have a writing center where they can get free individual help with their work. Links to writing center materials can be found on our Web site, www.unsv.com. And that's the VOA Special English Education Report, written by Nancy Steinbach. I'm Jim Tedder.